The morning began with a knock at my door by the Benton County Sheriff’s Department. It was my ride. Deputy Don Munson was there to drive me back to Fowler to pick up my trike. On the way, we got to talking about all the wind farms in the area and he remembered where the wind farm I helped get off the ground years ago was located. Problem was, it was considerably north of Fowler, and I didn’t have the time (or the energy, after last night) to pedal all the way up there and back from Fowler. Without missing a beat, he turned down a side road and headed north. So I got to visit my old wind project, courtesy of the Sheriff’s Department. Very satisfying to see the physical manifestation of something that seven years ago was just a hope and an idea. Surrounding us were 53 two-megawatt wind turbines generating green energy for Indiana and a providing a new source of income for farmers. 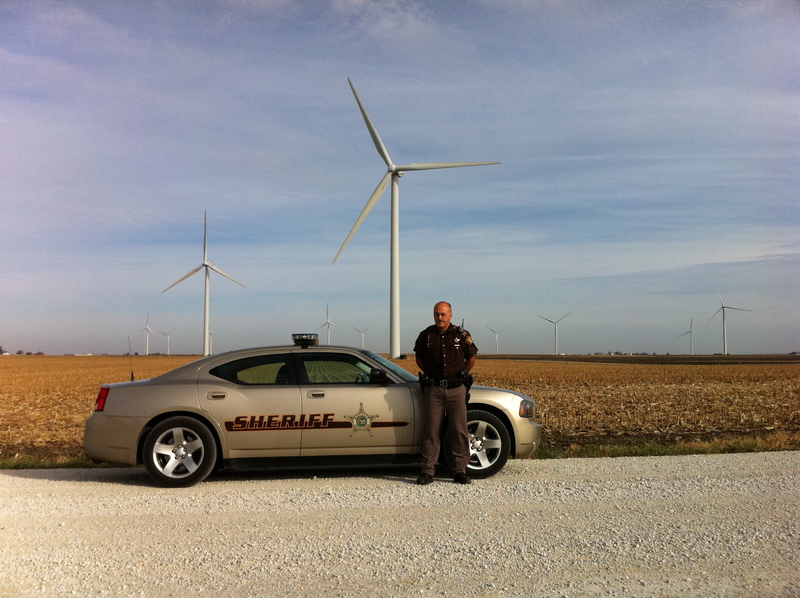 Officer Munson is a huge fan of wind power. Grabbed a sandwich at the local grocery store and headed down the road to Lafayette, where I wanted to visit Purdue University, and hopefully a bike shop to get one of my front tires replaced. Learned that the university was having their annual Purdue Space Day at the Neil Armstrong Hall of Engineering today, which coincidentally was right where I pulled into campus. Rolled my trike into the building and introduced myself to the organizers, who welcomed the addition of a “rocket trike” to their event. Interesting fact: Purdue boasts the first and last astronauts to walk on the moon. A few minutes later, 600 3rd-8th graders began streaming into the building. Had lots of great interactions with the kids, then was told Tom I-P. Shih, head of the School of Aeronautics and Astonautics, wanted to meet me. This led to a fascinating conversation with Tom, who in turn introduced me to the event’s VIP astronaut speaker. Astronaut David Wolf is the real rocket man, having logged 168 days, 12 hours, 56 minutes and 04 seconds in space over four separate missions. When I mentioned my trike, he asked if I had had any incidents with it. “Yes, in fact, I crashed it just last night…” which prompted this reply: “always put safety first.” Sound advice, coming from someone whose life literally hangs on that in space. He was curious to see the trike, so I walked him over to it after the event. By the time I found the bike shop downtown and got the tire changed, it was close to 5:00. Even though I’d only 30 miles logged on the day, decided to play it safe and not push it this time, and grabbed a motel for the night. 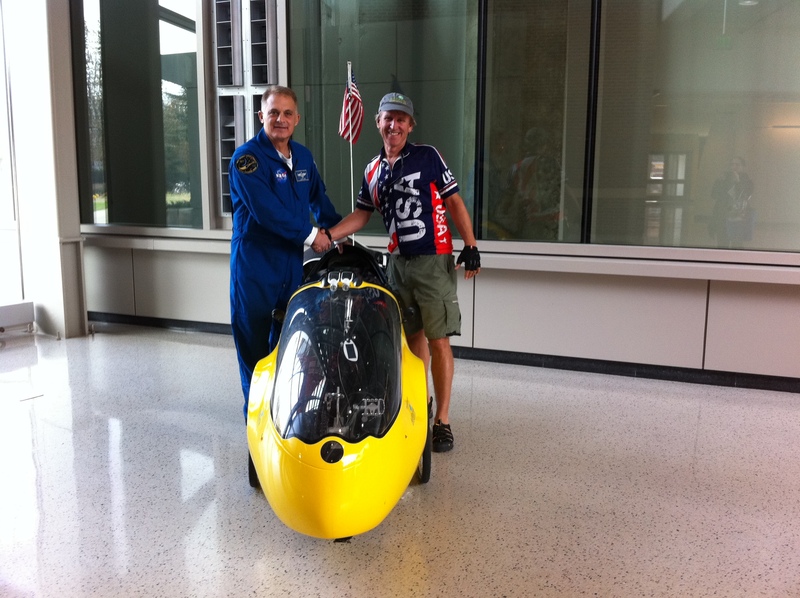 This entry was posted in 2010 Ride, Blog, Video and tagged david wolf, fowler, indiana, purdue space day, ride for renewables, wind. Bookmark the permalink. Thank you for stopping by Purdue Space Day this past weekend. I hope that you found the bike shop without too much delay; West Lafayette can be kind of confusing sometimes, and I am not used to giving directions to someone not walking– it is a lot easier to just cut through buildings and such. I wish you the best of luck on your future endeavors, and with your mission for the United States. I will provide any support that I can. As such, please let me know if I can be of any service within my leadership roles on campus.